1. What does Procyon Wildlife do? 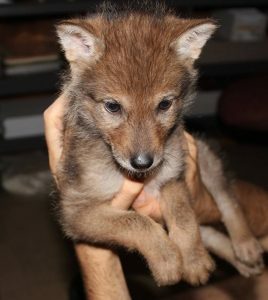 Procyon Wildlife takes in wild mammals that have been found or rescued by members of the public. We take animals that are known to be orphaned, injured or sick. We provide the necessary supportive, medical, and surgical care to these animals so they can resume their normal function and be returned to their natural habitats. 2. What does “rehabilitation” mean? Rehabilitation includes the care, support, and eventual release of a healthy animal into its natural environment. 3. Can all wild animals admitted to Procyon Wildlife be fully rehabilitated? Unfortunately, no. Though the majority of animals can be returned to normal health, many of them cannot. Its injuries are too severe for it to be able to function normally in its wild environment. An example would be a bird with a severely fractured wing that would be unable to fly once the wing has healed. It has been raised as a pet in a family home away from contact with members of its own species. As a result, it has not developed the social skills necessary to survive in the wild. An example would be a fawn which has grown up without other deer and has learned to prefer the company of people to that of its own species. 4. What happens with an animal that can’t be rehabilitated? It is humanely euthanized as soon as it’s evident that its injuries are too severe or that it cannot be released. In special circumstances it may be raised in a zoo situation or kept in captivity for educational purposes. 5. Is it true that once a person has touched a young animal that its mother will no longer accept it? No. Most animals are very good mothers and will still recognize and accept their young even after they have been handled by humans. Certain animals, such as cottontail rabbits and fawns have no body odor so their mothers don’t use smell to recognize them. 6. What should I do if I find a baby mammal? Call a rehabilitator immediately if the baby is obviously injured. The Ministry of Natural Resources can direct you to a rehabilitator in your area. 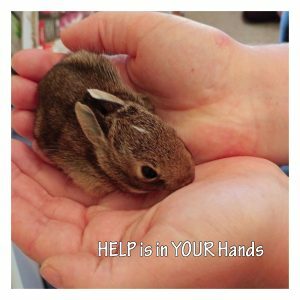 For a list of wildlife rehabilitators, please click here. Remember, a baby’s best chance for survival is with its mother. If the baby is alert and uninjured you should try to reunite it with its mother. This may be as simple as leaving the baby undisturbed where it was found (for example, a fawn). It may involve placing the baby back in the nest or den or, if the nest location isn’t obvious, in a box with a heat source, near where the nest is thought to be. Call a rehabilitator to learn the appropriate course of action for the species in question. The time required before the mother returns depends on the species. Some mothers spend a lot of time with their young, returning to the nest frequently. Others only see their babies for a very short time each day. Make sure that there are no pets or people in the area as mothers will not return if they know that a predator is present. Contact a rehabilitator to determine the appropriate time needed to reunite mother and young successfully. Call a rehabilitator if the mother doesn’t return after the appropriate time interval. Some babies may need to be brought in for the night and returned to reunite during the day whereas others are most likely to be found by their mothers after dark. A rehabilitator can advise you on how to best handle the species in question. Always take necessary measures to protect both yourself and the baby before handling the animal (wear gloves, cover baby with blanket, wash your hands after handling). 7. What should I do if I find a baby bird? Call a rehabilitator immediately if the baby is obviously injured, unable to move, or was seen to be attacked by a dog or cat. The Ministry of Natural Resources can direct you to a rehabilitator in your area. Determine the age of the bird to determine the appropriate course of action. Contact a rehabilitator if you are uncertain of the bird’s age. Nestlings have no or very few feathers. Their skin is clearly visible. They should be in a nest and need help immediately if they are not. Place them back in the nest. If the nest isn’t visible, place the baby in an empty plastic container lined with grass, leaves, or fabric and hang in the tree where the original nest was located. Observe from a distance. Call a rehabilitator if no parent visits the nest within 4-6 hours. Fledglings have more feathers than down and have no visible skin. They are active and are supposed to be on the ground where their parents feed them until they are ready to fly. Make sure your cats and dogs do not frequent the area until the babies have flown away. You can place the baby in a more hidden location or on a tree limb. Call a rehabilitator if no adult bird is seen in the area within a few hours. Always take necessary measures to protect both yourself and the baby before handling the animal (wear gloves, cover baby with light towel, wash your hands after handling). 8. What are Rabies Vector Species and what is their status in Ontario? Rabies Vector Species (RVS) are those species of mammals that can carry the rabies virus, thereby acting as a reservoir for the disease. Such carriers are capable of biting and infecting other animals for whom the virus is rapidly fatal. RVS pose a threat to humans because they may bite pets who then transmit the disease to their owners. RVS include bats, skunks, foxes and raccoons. In 2015, Ontario had its first case of raccoon rabies in ten years, so it is not a common problem. Bats represent the largest number of RVS in this province. The number of identified cases is extremely low, thanks to the use of improved oral vaccines. 9. 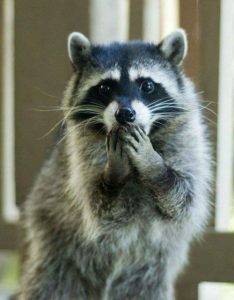 Do raccoons make good pets? Because baby raccoons are so cute, friendly, and cuddly, people think they make good pets. It is a fact that for the first few months of their lives, baby raccoons are very friendly, easily housebroken and a pleasure to be around. However, there are many reasons not to keep them as pets. It is illegal to house wild animals for more than 24 hours unless you are an Authorized Wildlife Custodian, licenced by the Ministry of Natural Resources. Wild animals should live in the wild. They are not happy being kept in captivity, a situation tantamount to your being jailed at another person’s whim. Once they reach 6-8 months old, raccoons become very territorial, unpredictable, and aggressive. Their teeth and claws can cause severe injuries. Raccoons carry an intestinal parasite, known as raccoon roundworm. The eggs from the worms are spread in the feces and can be found on the raccoon’s fur, cage, and bedding. When these eggs are ingested, usually by inadvertent hand-to-mouth transmission, they migrate to the central nervous system where they cause considerable damage and resultant brain disease. The eggs in the environment are very resistant to most cleaners and are hard to get rid of. 10. Can I keep wild animals in captivity rather than taking them to a rehabilitator? No. It is illegal to house wild animals for longer than 24 hours unless you are an Authorized Wildlife Custodian, licenced by the Ministry of Natural Resources (MNR), or a licenced zookeeper. You are required by law to transfer any wild animals to a licenced custodian as soon as possible. If you want to help rehabilitate wild animals, you can apply for your Authorized Wildlife Custodian licence through your local MNR office.